The Council of chiefs is composed of one traditional leader from each of the Republic’s states. The council advises the President on matters concerning traditional laws, customs and their relationship to the Constitution and the laws of Palau. 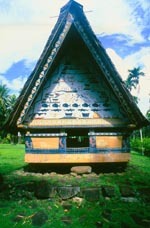 Palau’s traditional chiefs have advisory authority at the national level through the Council of Chiefs. This council is highly respected and works closely with the elected officials on a variety of local and regional issues. This ensures the preservation of traditional ways and the continued success of the democratic government.